On this page you will find some frequently asked questions about using the Dolomite webshop and our microfluidic products. If you have any additional questions that you can’t find the answer to on this page, please contact us and we will help you. I have created an account but didn’t receive a confirmation email. What should I do? Please contact marketing@dolomite-microfluidics.com and we will check your account details and send you a new confirmation email. I forgot both my username and password. How can I reset my account? Please contact marketing@dolomite-microfluidics.com and we will reset your account and send you a confirmation email with your new login details. How can I see the prices of your microfluidic products? Create an account which will allow you to browse prices and place orders online. Click here to create an account. How can I get a quote for your microfluidic products? Quotes can be generated via our microfluidic web shop. Simply create an account, log in and select the products for which you want to create a quote. Add all products to the shopping cart and select “Request quotation” in the checkout process. We do offer discounts for large quantities, pump solutions and system solutions. Please contact us for more information on sales@dolomite-microfluidics.com. How does Dolomite store personal details of its customers? What are the classification of chips? We sell a wide range of microfluidic chips including Porous Media Chips, Droplet Chips, Mixer Chips, T-Junction Chips, Membrane Devices. Click here to visit our microfluidic chip webshop page. What are the types of coatings on the chips, and what is the relevance? What surface chemistry is my chip available in? Hydrophilic - this is bare B270 type glass cleaned in our propreitary methods, to an ultra clean finish. The result is a highly hydrophilic surface which is wet by water. The exposed surface chemical groups are OH-2. Applications include: Production of organic (Mineral Oil, Dichloromethane, Hexadecane) droplets or gaseous bubbles (air, N2He) in water. Hydrophobic - this is established by applying a silanizing agent onto the bare glass surface. The finished surface has a self-assembled monolayer of silane groups, rendering the surface as water repelling. Applications include: making aqueous (water, dna solution, protein solution) droplets in organic (mineral oil, Mineral Oil, Dichloromethane, Hexadecane, Pico-Surf™ fluids. We also offer a hydrophilic, hydrophobic and fluorophilic version in Quartz(as compared with B270). The surface effects are very similar, with the only significant difference being in the optical transmission/absorbance properties when used in UV radiation applications. What pressure can my chip withstand? Most chips are rated to perform at up to 30 bar. A small subset of chips (Porous Media Chips) are rated to perform at over 100 bar. The individual datasheets for chips will provide more information regarding chip performance. Click here to navigate to your chip of interest. What are the common chip etch depths? Common chip etch depths are 5, 14, 50, 100, and 190 µm. To view our full range of chips and available etch depths, click here. What is quickest way to find dimensional information for microfluidic chips? Product specifications are found in the datasheet for the chip of interest. Datasheets are available as PDF downloads on the chip webpage. What liquids are compatible with my chip? Please refer to the table below to check what liquids are compatible with the coating on your chip. How do I clean my chip at the end of the day? With the exception of PDMS chips, this procedure is an effective way to help clean all the chips supplied by the Dolomite Centre. This procedure should be performed in a well ventilated area preferably with Local Extraction Ventilation and wearing appropriate PPE. The liquid used should reflect what has been used during your experiments or is miscible with it, i.e. water, organic solvent or oil, but without your active ingredients. Please refer to the Chemical Compatibility Table before cleaning your chip, as some liquids may not be compatible. 1. Pump your liquid(s) in the forward direction a flow rate of ~1ml/min for 5 minutes, but do not exceed the pressure limit of the chip. For details of the pressure limit for your chip, click here to navigate to your chip of interest and read the associated datasheet. 6. Store your chip, connectors and seals in a dust free environment. My chip is blocked, how do I clean it? With the exception of PDMS chips, the proceedure below is an effective way to help clean all the chips supplied by the Dolomite Centre. Of course, prevention is better than cure. To reduce the likelihood of a blocked chip from particulates, all liquids including any cleaning solutions, should be filtered before they come into contact with any part of your Microfluidics system. This should be done even if your chip has a built in filter. We supply a 2µm in-line filter, which is well suited to removing tiny fibres prior to the chip, a common cause of blocked chips. We also suggest that you use a 0.1 – 0.2µm filter, with the appropriate chemistry, to pre-filter your liquids. They are readily available from a number of suppliers. Can I autoclave my chip? It is acceptable to autoclave an uncoated chip, e.g. hydrophilic, as long as the connectors are removed first. Product datasheets contain a wealth of information, including maximum operating pressure, compatible connectors, available chemistries and alternative chips in the same category. Datasheets are available as PDF downloads on the chip webpage. If there is a chip you are interested in using, but doesn't currently have a coating compatible with your chemistry, please contact our sales team for help with custom coatings. Is there any maintenance needed for the Dolomite pumps? In general, it is good laboratory practice to clean your Pumps after any use. Where possible, we recommend pumping acetone through the pump liquid path and associated liquid channels and valves. This is an excellent solvent for cleaning and also evaporates readily after use. This procedure should be performed in a well ventilated area preferably with Local Extraction Ventilation and wearing appropriate PPE. The P-Pump also requires the O-Ring inside the lid of the pressure chamber to have a light coating of silicon grease. Simply pop out the O-Ring with, for e.g. a fine pipette tip or non-metallic tool. Wipe it clean with a lint free wipe and smear a thin layer of silicon grease before reinserting into the lid. This only needs done once or twice a year. My flow sensor is blocked, how do I unblock it? The easiest solution is to use compressed gas from a cylinder. In the Flow Sensor datasheet you will find the maximum operating pressures for our range of flow sensors. Ensure that the pressure at the regulator on the gas cylinder is set accordingly. Please note that this procedure must be executed in a safe environment wearing appropriate PPE and especially safety glasses. For your safety, we suggest that during the unblocking procedure, the flow sensor is shielded within a box. How can I prevent blockages in my flow sensor? All liquids and gases pumping through your microfluidics system should be pre-filtered. We supply in-line filters for this purpose which are good for removing larger particulates For smaller particulates, try using 0.1-0.2µm filter with a chemistry appropriate to your liquids. These are widely available to use with syringes or for larger volumes as required. I want to calibrate my flow sensor with different liquids apart from water, how do I do this? What is the difference between the various types of connectors? Dolomite has introduced a new open standard connector: Multiflux®, now available in two versions: Multiflux-1 (M1) and Multiflux-2 (M2). Multiflux-1 is a wide range of connectors, interfaces, and accessories compatible with 1.6mm (1/16") diameter polymer tubing. Popular connectors use up to 4 inlets and 4 outlets per chip. Multiflux-2 is a wide range of connectors, interfaces, and accessories compatible with 0.8mm (1/32") diameter polymer tubing. Popular connectors use up to 7 inlets and 7 outlets per chip. Some chips are usable interchangeably between Multiflux-1 and Multiflux-2. Click here to navigate to the Connectors page. What is the difference between a linear connector and a circular connector? The Circular Connector is a specialized connector compatible only with the following chips, 3000048, 3200161, 3000211, 3200123. There are droplet chips with variable depths and surface coatings. The Circular Connector provides 6 fluid ports, of which typically 2 are used for outlet, and 4 are used for inlets. The Linear Connector on the other hand is compatible with a large number of chips (Droplet, Mixer, T-Junction, and Resealable chips). It enables connection via 4 fluidic ports of which at least 3 are typically used as inlet, and at least 1 as outlet. Both connector types, while useful for connecting to chips, can also be used for interconnecting just tubing. This can be useful for extensions to setups, where additional tubing lines need to be temporarily attached. E.g. The circular connector can connect 6 tubing lines with another 6. The linear connector can connect 4 tubing lines with another 4. 3D printing is a process used to synthesise a three-dimensional solid object. Layers of material are stacked under computer control to create an object. The object can be of any shape or geometry, and is produced from a 3D CAD model. Traditional fabrication techniques in the fluidic/microfluidic industry are too slow and expensive for a prototyping approach. Many users require pumping fluids at pressures of up to many bars, and traditional 3D printers fail to create devices that seal at such pressures. Also the materials available to use with 3D printers are inappropriate for the applications in microfluidics being chemically not compatible, non-transparent, etc. For these reasons, a lack of options has prevented the fluid handling user community from exploiting the 3D printing technology until the introduction of Fluidic Factory. Fluidic Factory is the first commercially available printer capable of fabricating fluidically sealed devices. Fluidic Factory uses COC (cyclic olefin copolymer), which has many benefits over other polymers: FDA approved, optically transparent, non-auto fluorescent, and biocompatible. Why did we choose FDM printing method? Compared to other 3D printing techniques FDM (fused deposition modelling) is generally cost-effective and fast, and hence ideal for prototyping. SLA/SLS use UV-curing materials which are not representative of the final materials used in biological applications. Contrarily, FDM can use attractive materials in the biological field. What is so unique about COC? What grade of COC is used? How is the filament manufactured? Extrusion of COC pellets in-house. Dolomite is the manufacturer and sole supplier of the COC filaments. The COC reel comes with a disposable nozzle fitted for the Fluidic Factory. 77°C. This is the upper limit of the recommended operation temperature for printed devices. Above this temperature, the pressure rating decreases. The maximum pressure sealing is 10-20 bar (design dependent). Bulk COC is a transparent material. The degree of light transmission of COC is 91% (test standard ISO 13468-2), and the refractive index is 1,53 (ISO 489). These values are measured on non-3D printed COC, without any surface treatment. The thicker the device (i.e. the more layers), the lower the optical access. FDM printers eject the molten polymer, which cools down and solidifies. What is ejected is called a bead. The size of the bead depends on the speed that the nozzle is moving, the nozzle diameter and the rate at which the polymer is ejected. How is fluidic sealing ensured? The desktop PC software analyses the 3D geometry of the device and identifies the internal voids and surfaces. The print paths are then created from the inside of the device outwards and the print head deposits filaments in a continuous, leak-proof manner. Fluidic Factory's clever design allows filaments to melt together when depositing on top of each other. A small volume of polymer is melted to a fluid state at very high temperatures and only held a few seconds before ejecting and depositing in a 'squashed' manner. This ensures excellent adherence, optimal polymer quality and leak-free channels. Fluidic Factory uses a 'squashed' bead method when depositing beads as opposed to many traditional FDM printers which deposit beads in a circular cross-sections. 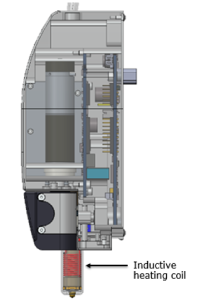 This is due to the fact that the system is optimised for fluidic sealing. What are the achievable bead sizes? 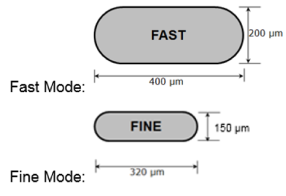 Fast mode uses 400 × 200µm obround cross section bead size. Fine printing uses 320 × 150µm obround cross section fibre size. Fine mode leads to increased operating pressure and greater fluidic sealing. Fast mode allows quicker prototyping, useful for larger print items. What resolution can the FF print at? Machine axes motion resolution: The Fluidic Factory is highly-engineered from a mechanical point of view, moving in one step of resolution of ~ 100 nm [Exact figures: x & y movement: 124 nm. z movement: 195 nm]. Fluid deposition accuracy: Currently, when printing with the FF the polymer (COC) has a waviness of +/- 20 µm , with which channel widths of 300 µm3 and up can be achieved (subject to geometry). How long does it take to print a device? How many chips can I print with 1 reel? (Note: if a device is too small, adhesion may be compromised). How does the software contribute to the hardware components of the Fluidic Factory? Fluidic Factory's Software is programmed to focus on creating fluidically sealed pathways and is perfectly matched to the Fluidic Factory hardware. The desktop PC software analyses the 3D geometry of the device and identifies the internal voids and surfaces. The print paths are then created from the inside of the device outwards and the print head deposits filaments in a continuous, leak-proof manner. 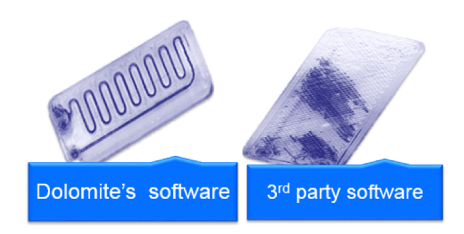 The image below left shows a device obtained when printing using Fluidic Factory Software. Our engineers tested Fluidic Factory with 3rd party software, and even highly optimized, the 3rd party software did not embed proper channels into the COC chip nor seal channels. This can be seen in the image on the right. Print files are open format files and may be downloaded from the Design Library. Designs can also be created by CAD software and then saved as a .stl file which carries information about the surfaces of the model. 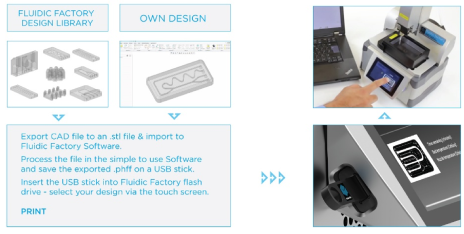 The Fluidic Factory PC software accepts .stl files and outputs print files (.phff). After importing a .stl file, the PC software creates a graphic illustration of the device. It then illustrates 2D slices, one slice at a time, reconstructed from the .stl information. The user is able to visually inspect the 2D slices to understand the print path of the print head. During this stage, the user is also able to adjust the model to decide the print orientation. The user can scroll through the layers, and once satisfied, finalize the creation of the print file. This file is then copied to a USB flash drive and connected to the PC. Dolomite has collected a selection of designs ready to be used with Fluidic Factory. The files are available in .phff (print-head-fluidic-factory) format, and available for download from our Design Library. Where can I get help with my design? Contact us to get a copy of our Design Guidelines. Yes, software upgrades can be carried out via USB stick. Why is the nozzle unique? Manufactured as one single part: polymer does not get stuck within the nozzle. Inductive heating coil: The nozzle is surrounded by an inductive heating coil which melts the COC at very high temperature (240°C), leading to the filaments melting together when deposited on top of each other. Organ-on-a-chip, point of care diagnostics, drug development, chemical synthesis, enzymatic bioconversion, educational, biomedical assays. Droplet and emulsion chips, micromixers, microreactors, custom connectors, custom fluid manifolds, sensor cartridge design, valves, connectors, medical devices. What are the largest devices Fluidic Factory can print? Maximum print volume is 80mm x 50mm x 25mm (this limitation is correlated to the heated print bed size). Can I print multiple chips at once? Yes. The PC software checks models, so inconsistencies with the device design guidelines is likely to be flagged. The Fluidic Factory is designed not to require any maintenance. Semi-disposables (print bed, glass print surface), and disposables (fibre reel). A one-time installation and is required for clipping together the Fluidic Factory base with the print head. When the unit is first installed and when moved, it is also advisable to calibrate the unit by following the on-screen instructions. It is advisable to have a Dolomite representative do the installation and training. The training will include various 'how-to's' to ensure a smooth running of Fluidic Factory. Are there training courses available for using Fluidic Factory? Fluoro-Phase is an emulsion oil for droplet microfluidics applications. It consists of fluorinated silica nanoparticles in Novec-7500 fluorinated oil, which form Pickering Emulsions of aqueous solutions in Fluorinated oil. What chips are compatible with Fluoro-Phase? For best results, we recommend using fluorophilic glass chips. How do I break the emulsion? The same methods used for breaking other water-in-fluorinated oil emulsions using perfluorooctanol work with the emulsions produced with Fluoro-Phase. Dispose of waste Fluoro-Phase oil with other fluorinated solvent waste according to applicable local laws. How should I store Fluoro-Phase? Fluoro-Phase should be stored at room temperature out of direct sunlight. Fluoro-Phase, and emulsions made using Fluoro-Phase, can be refrigerated. Due to the nanoparticulate nature of the emulsion stabilisers, we do not recommend filtering through pores smaller than 1 µm. Filtration through a 0.2 micron filter will work, but may cause a reduction in stabiliser concentration. The emulsion stabilisers used in Fluoro-Phase scatter light. This is normal. We do not recommend centrifugation at speeds greater than than 4,000x rcf. Fluoro-Phase is stable at temperatures relevant for applications such as PCR. We do not recommend heating it beyond 150°C due to the risk of decomposition of the fluorinated oil, giving potentially hazardous by-products. Do not store Fluoro-Phase at temperatures greater than 30 °C. Is it compatible with my biology? Fluoro-Phase is compatible with most biological buffers and does not affect cells encapsulated in droplets. As with all emulsions, certain cell lysis agents may affect droplet performance. If you have questions about your specific application, please contact our applications team. I’m unhappy with the product. What should I do? Why aren’t my droplets forming properly? While Fluoro-Phase is less likely to be affected by detergents than other emulsion stabilisers are, some detergents in the droplet phase (used for cell lysis) can cause droplets to coalesce. Try reducing the concentration of any detergents present in the aqueous phase. Static charging of droplets can cause problems, ensure that your device is properly earthed. Ensure that your flow rates and pump pressures are steady and within the recommended range for the chip you are using. If flow rates temporarily enter a non-droplet-forming (jetting or slug flow) regime, returning to the previous flow rate may not be enough to restore droplet formation. Why is Fluoro-Phase better than other emulsion stabilisers? Fluoro-Phase outperforms other emulsion stabilisers in tests of droplet formation rate, ability to stabilise reverse emulsions, and stability of droplets off-chip. It is also resistant to destabilisation by detergents used for cell lysis, and prevents small molecules leaking from the droplets into the continuous phase.